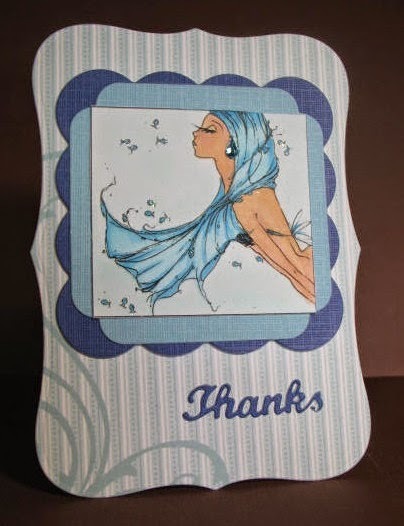 I so enjoyed the delightful images I'v shown to our Die Cut Divas around the world. A beauty of the depths? The shapes for this card just leapt into my hands to be cut. I hope you like her as much as I do. May your scissors be sharp, but not your heart. Thank you all for following us in our challenge journey all this month. The winner will be chosen June 2nd. I Love a Piano, a Grand Piano! Music has always been a big impact on my life, and I began piano lessons with my Grandma at the age of 6 or 7 at the time I didn't care much for the lessons and practice but over the last 3 years I started back with much more interest and love to practice daily, so whenever I come across anything "music" in the stamping world I just have to pick it up, this Grand Piano from a day for daisies was the perfect image! My inspiration, this song sung by Judy Garland in the "Easter Parade"
I hope you enjoyed the Fun Challenge put up by Arlene, and come back in June for more fun! A Day for Daisies has some fabulous free digital stamps and I wanted to highlight a favorite of mine and the Divas thought we'd present the same image on our cards. Here is Vintage Slip. Such a beautiful image. Dawn embossed down one side and added white gelato. Embellishments: paper flowers, pearls and die cut leaves. This little lady has pearls woven through her hair. Again, I'm with the golden hair. I'm sure it's just a phase I'm going through. I guess you see a pattern in the images I picked, all feminine images. I couldn't help but pick this wonderful image. I love the unique way she is posed, with her back to us. It just reminded me of softness and delicate beauty. With Digital Stamps, you can copy and paste them into Word if you are not techy, like me. You can take the CROP tool and crop an image quite easily, as I've done below. Would you believe this is the same image? Different hair color and style. Not only is re-sizing available, but choosing a part of the image is even more fun. I hope you try cropping an image and adding more tools to your skills. Die Cut Divas' Sponsor for May! 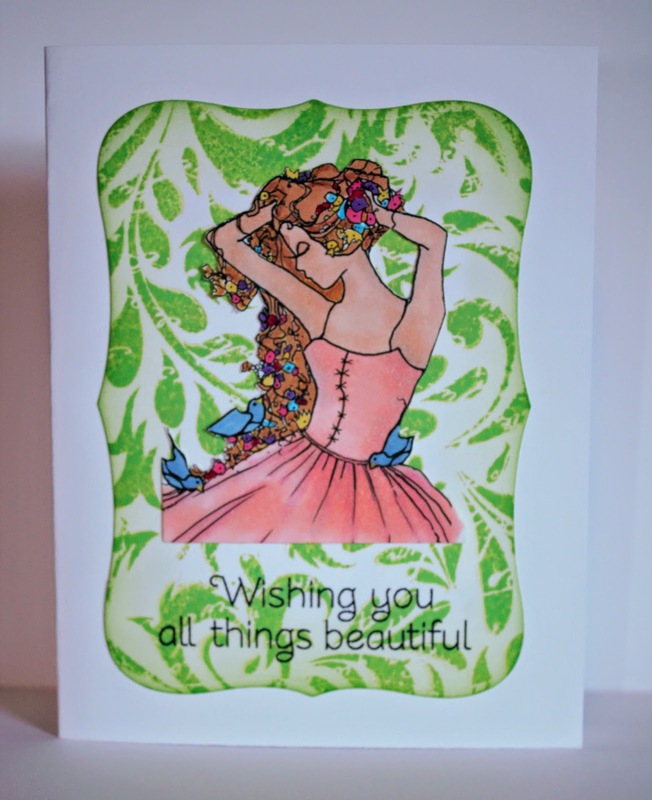 Lin has graced us with her talent in card making today, using some of our sponsor's designs. Lin has always impressed me from the time we all became members of the Hero Arts Flickr group. Lin has such a flair with flowers. 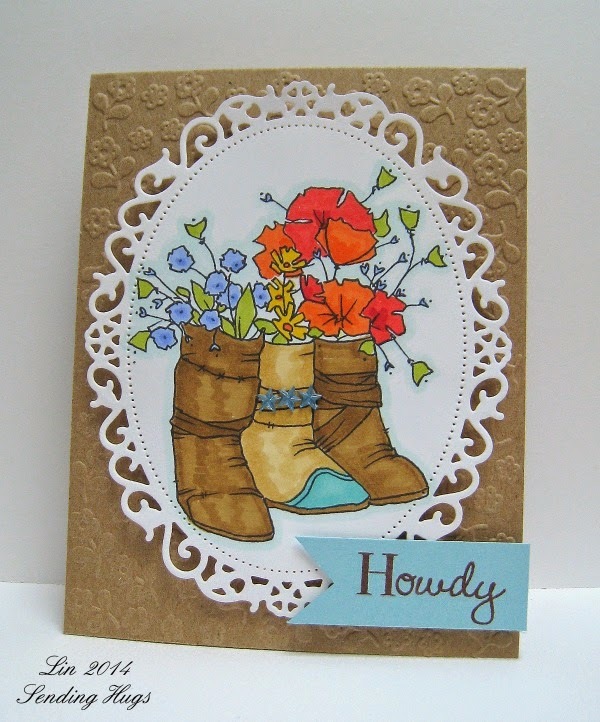 I love the boots and wild flowers - reminds me of the country and has such a homey feeling to it. "Howdy" is certainly the right sentiment. Such lovely soft colors. If I were to hold this card in my hands, I would be afraid to touch the winged fairy for fear she might be frightened away from the flowers. To Lin, I give a big "Thank You" for being my guest for May's challenge. The ONE, the ONLY, LIN! Time for our guest spot for the month of May and it's none other than our friend, Lin Brandyberry who stars on our May blog. Help me welcome Lin to the stage. I've been married to my hubby Denny for 43 years this June! We have 2 grown sons who live in Florida and Texas, and 3 adorable grands, 5, 3 and 1 1/2. I have a degree in Mathematics, but was lucky to be a stay-at-home Mom. Before discovering card making, I did lots of cross-stitch and then quilting. I enjoy reading, the flowers in our gardens, and travelling whenever we can. I am a 10-year breast cancer survivor. It sounds like Lin has been a creative person from her list of hobbies. Whether we know it or not, math does have a lot to do with the creative process. So glad you're sharing your life and creativity with us. I think I began stamping sometime in the early 2000s, but didn't take it seriously until 2005. 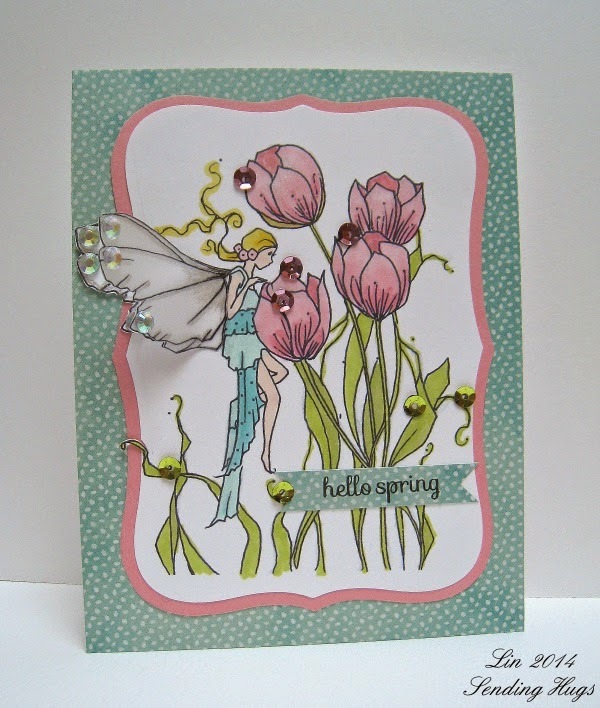 I credit the Hero Arts blog for appearing just about the same time I started stamping – it was the perfect online school, and I learned so much there! I consider myself a card maker. I've done a few scrapbook pages, but that process just hasn't clicked for me. I'll follow a sketch if that's what a challenge needs me to do; otherwise, I dive in, choosing colors or papers or stamps and going from there. I stamp just about every day, though I may not produce something finished each day. In looking back through my blog, I'd estimate I have a post with a finished card about 3 - 5 times a week. Sounds like Lin really loves the process, stamping, coloring. That’s got to be my trusty old Cuttlebug machine! I use it on every project, I think! 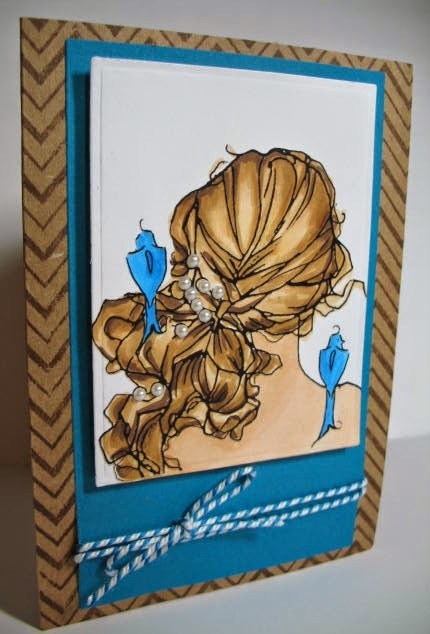 This is one Die Cut Diva! I just learned how to make shaker cards, and they are so much fun! Also using embossing folders with ink as a kind of stencil has opened up all kinds of possibilities! I think I'm evolving slowly into a more clean and layered card maker. I adore looking at other cards that are vintage and packed with all kinds of embellishments, but I just can't seem to pull it off myself. I really enjoy paper-piecing and using design papers. And you'll usually find flowers or hearts on my cards, along with pearls or gems, or now sequins. Lin is my Flower Diva too. I need to slow myself down during the creative process. I will finish a card, post it, and then see, in looking at the photo, that I could have changed something to make it better. I have been published during the last days of print magazines, in 2012 and 2013, in Paper Crafts, CARDS magazine, and CardMaker. When everything went to digital, the fun went out of it for me, and I stopped submitting. I'm on the Simon Says Stamp Wednesday challenge design team at present - a real dream of a team! Past design teams were Lily Pad Cards, The Craft's Meow, and a 6-month term at the Penny Black Stamp Squad. And I consider my term as a Hero Arts Hostess as a kind of design team, too. I was in the 2nd class, from July to October of 2009. They know talent when they see it! I'm lucky enough to have a whole room for my supplies. Denny built me a work surface under the window, and the computer lives in the former closet in that room. I have lots of open shelving for my supplies, along with a couch and a TV in there (this room doubles as a guest room) and a little bathroom just across the hall for cleaning my stamps, etc. Please pay a visit to Lin's blog. You'll return time and time again. We have a Guest for you - Tomorrow! Guest Spot Wednesday and Friday.... It's a Surprise! But I can hardly wait to tell you. But you have to wait until tomorrow! Sponsor for May 2014 - None other than A Day for Daisies! Happiness is Where we Find It. And yet again, Dawn opens our hearts and makes us happy. Using Pansy Frame from A day for daisies and a sentiment from Couture Creations. Embellishments: black gems. When a hat was a hat. I love hats, but hate to wear them. When I see digital vintage images, I just love to see those large fun hats. The one thing I love about digital stamps is that you can re-size them. This beautiful woman from A Day for Daisies is sophisticated and lovely. The images catch the eye and hold it. I did trim the hat of the lady in pink with Stickles and a red glass gem. Otherwise, I believe you don't really need anything else. Since the smaller image was oddly placed on my printout, I just used a narrow oval die and placed her off-kilter. I rather like it. Adds something. A few gems and a "Thanks" die cut are adhered to the image panel. I found this wonderful light blue paper with glitter stripes to bring out a bit of sparkle. Repeating the foundation panel color near the center panel kept the colors strong and well focused on the image. The vintage woman of the day hopes you have a great weekend. Aren't these fabulous images? So glad I discovered A Day for Daisies. I love being able to color these images. The hepburn image on the right was cropped so I could use just the upper body for my tag. 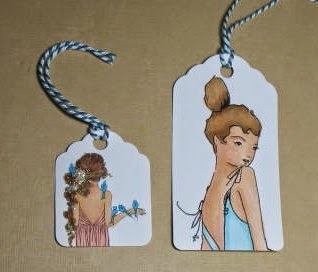 Reminds me of my granddaughter and so I made these tags for my beautiful granddaughter. I hope your month is as beautiful as these images! Happy Mother's Day to all out there. Most of us celebrate Mother's Day in one way or another, as a daughter or a mother. Our sponsor, A Day for Daisies" has some wonderful images for you to choose from and I love how this "Braid in My Hair" image turns out. I made this card for my daughter-in-law. She always had long hair with red highlights until a couple years ago, so I thought this image would be more personal. I rather like it and this is one I would love to keep - well, I know Rosalie will appreciate it, so that counts. I can't help thinking of the fairy tale, Rapunzel. What a lovely sweet young lady. I loved coloring her and found the perfect background pieces for this card without any trouble at all, which is rarely the case. The image was so easy to color. 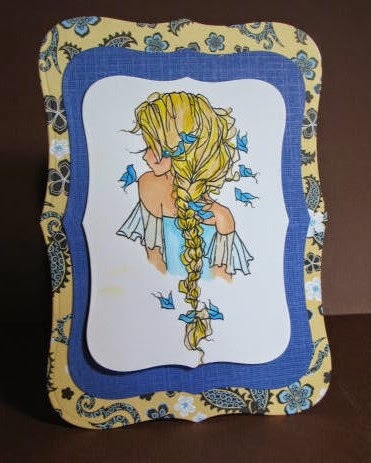 I chose the colors for the hair, then the birds, little blue birds chirping and hopping around, then her dress. I didn't think it could be any other color but blue. I hope you like her, because she is such a lovely image. Dawn has left me speechless. The colors, background are all perfect. 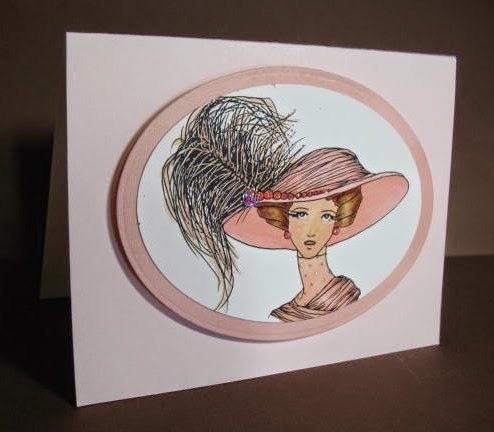 Touches of sequins maket the perfect touch to finish this card - a little goes a long way. 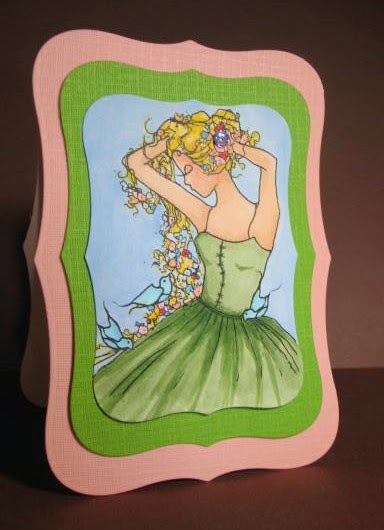 Doesn't this card make you want to pick up this beautiful lady to see what you would like to do with her. Or has Dawn left you breathless with wonder? Hop over to Dawn's blog to see more details. 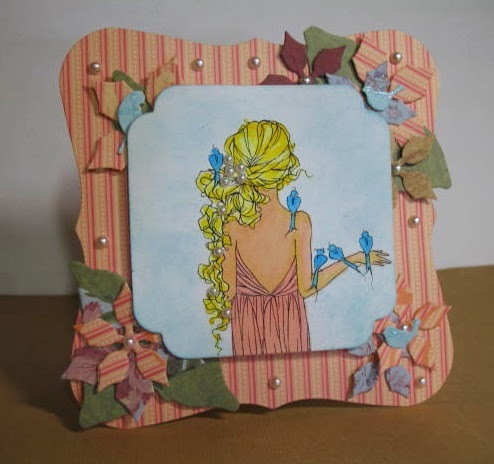 Congratulations to #10, Emily Shroom , who will receive 7 free images from Bugaboo Digi Stamps. You may either email our Blog email and Hannah will let me know you've responded and I can contact you to tell you how to get your prize from Bugaboo Digi Stamps. 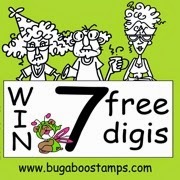 Do remember that Bugaboo has free digital stamps on Friday. May Day comes up Daisies. May I invite you to A Day for Daisies? Why, thank you. Don't mind if I do. Cute name for some wonderful digital images. As soon as I found this site, I knew I had to have some images. Aren't these cards delightful? 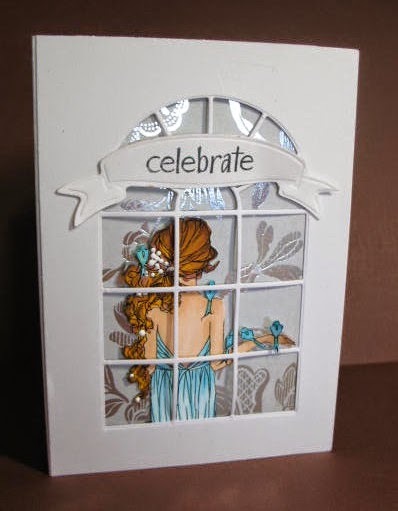 May's challenge: Use at least one Embellishment - pearls, sequins, gems, appliqués, beads & buttons, hair bow, lace & trims, rhinestones, charms, pendants, ribbon, feathers, flowers, bows,gears, findings, some type of ornamentation.and of course a Die-cut or Embossing folder. Dawn at Dawn's World added gems, pearls, flower and leaf stickers.